In any test prep course, taking practice tests is a must. But how do you review and learn? ePrep courses feature expert video instruction, available to you whenever and wherever - day or night, at home or on the road. It’s like having your own private tutor right next to you, guiding your progress every step of the way. If the SAT and ACT tests were administered online, it might make sense for you to complete practice tests online - but they aren’t. Start your ePrep course by downloading and printing a practice test. Take the test under timed conditions. By simulating the real test environment, you'll be better prepared to maximize your score. Immediately grade and score your test in the Exam Room. Enter your test answers, hit “submit,” and immediately receive your score! ePrep highlights all correct, incorrect and skipped answers and displays a projected score. Watch detailed videos from a test preparation expert. ePrep visually shows you which question you missed and the correct answer. Quickly launch the video explanation right next to the question. 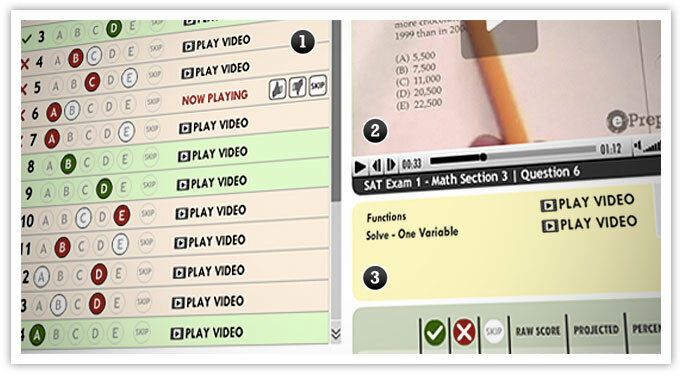 Each test question is cross-referenced to the underlying subject lesson represented, so you can also play the lesson video in the same video window. You can watch detailed video explanations for every single test question in every course. Demonstration improves learning and problem solving by 300%*. You can use your senses. Most online courses and books force students to "read" the answer and fall short of teaching. Students can pause, rewind and watch each video explanation over and over. We explain just like real tutors would. Our Study Hall features over 100 subject lesson videos and tracks your progress so you know exactly where to focus. Other test prep courses simply have you take one diagnostic test to determine your strengths and weaknesses. That’s insane! 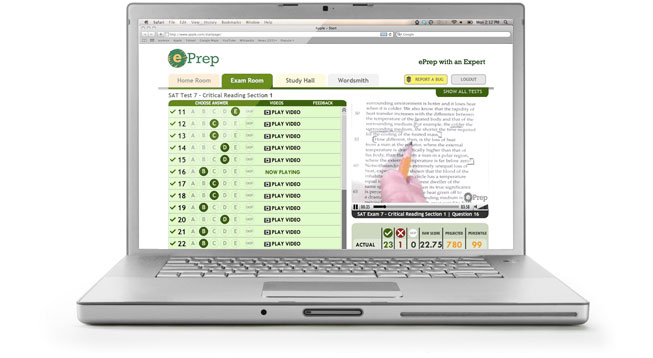 ePrep monitors your progress throughout your course and recommends specific subject lessons to review. The Study Hall even shows you which test questions you missed for each specific subject lesson. All ePrep courses include WordSmith, a powerful and interactive tool that will systematically help you build your vocabulary for test day and beyond. Features over 1,400 common SAT/ACT test words. 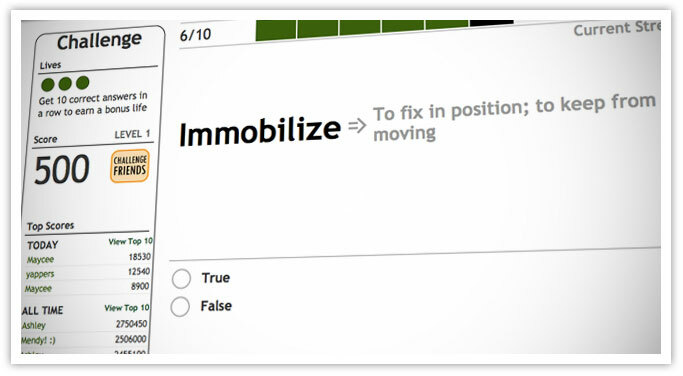 Sort words into knowledge lists, review them using electronic flash cards, and test your knowledge through customized multiple-choice or true-false tests. Challenge your friends online to beat your WordSmith Challenge high score. ePrep courses work. That’s why we guarantee them. We've gathered a team of experts in standardized test preparation and internet technology to create the most innovative and effective program on the market. © 2006-2011 ePrep, Inc. | all rights reserved.